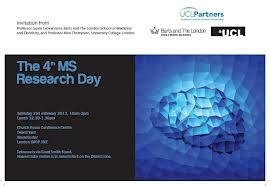 On Saturday Feb 2nd Barby and I went up to London to attend the 4th Multiple Sclerosis Research Day. It was held the Church House Conference Centre next to Westminster Abbey. This is an annual event and it gives people an opportunity to find out about the latest research into multiple sclerosis. Naturally the disabled parking spaces were at a premium but we managed to find one. The first Research Day was held in 2009 and each one has been better than the previous. The first one was help at a lecture theatre at he Royal London and it was not very disabled friendly. Everything is much better at the conference centre. The funders of the Prof G team call for him and his fellow researchers to engage with the public, those with MS and their families. These people must be told about the current research and the work being done to improve the lives of those with MS. I have always understood that MS is an autoimmune disease but no one has really understood what causes it in the first place. It is a complex disease because both environmental factors and genetic factors are involved. All people who have MS have the Epstein Barr virus (EBV) in their body. The current thinking is that MS is a viral disease. EBV is present because of a previous infection of glandular fever. The presence of the EBV does not mean that you will get MS. Obviously there are other factors, such as month of birth. Spasticity, a very common problem in MS Sufferers. It is a muscle control disorder that is characterized by tight or stiff muscles and an inability to control those muscles, this can make walking a challenge. We were shown how a woman’s walking improved using Functional Electrical Stimulation and a Baclofen pump. I am an ideal candidate but consideration has to given to the fact that I am on the ASCEND trial. There was a very interesting talk on bone health and falls. People with MS are quite likely to fall over, look at me. Life with MS is hard enough and it should not be made any worse by having broken bones. The problem is that people with MS tend not to take enough exercise and this makes the bones weaker. Also Vitamin D is important because this is a vital component in generating Calcium, this makes the bones stronger. Lumbar punctures was the theme for another presentation. A lumbar puncture is used to collect cerebral spinal fluid (CSF). 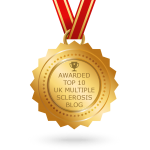 This can give a very accurate indication of the efficacy of the drug at slowing or stopping the progress of MS and this is an objective measurement. Just talking about a lumbar puncture sends a shiver up and down my spine. Don’t worry, I have had one and will need to have at least one more.